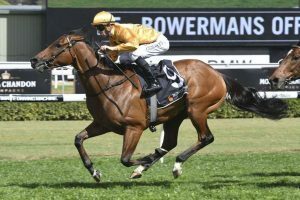 A decision by Bjorn Baker to step Sir Plush beyond a mile for the first time in his 36-start career has paid dividends with the six-year-old claiming Thursday’s Listed Gosford Gold Cup (2100m). Given a perfect steer by Glyn Schofield, who settled the gelding just off the speed, Sir Plush was able to claim Satono Rasen inside the final 25m to score his first black-type victory and his first win in any grade since October 2017. Leader Fabrizio stuck on gamely for third, narrowly holding out favourite Roman Son for the placing, who charged late after taking an eternity to wind-up from back in the field. Schofield said Sir Plush had given the impression a step-up in trip would suit following a narrow defeat over 1550m on the Kensington track at his previous start. “He was a little unfortunate he didn’t win the other day, but he showed a lot of fight and he gave me the indication that stepping up in trip wouldn’t be a bad idea, so well done to Bjorn for deciding to put him in this race,” Schofield told Sky Thoroughbred Central.